After her husband Gray Farmer’s death in July 1893, Argent Farmer went to court to get what she felt was hers. She filed suit against Daniel Vick, asserting that he had claimed title to a parcel land that had rightfully belonged to Gray and from which she was entitled to dower. Gray Farmer had indeed owned property as tenants in common with Charles Battle, Washington Sugg, William McGowan, and Wilson Barnes, but not at the time of his death. On 13 February 1886, Gray and Argent Farmer conveyed all their title and interest to the property to J.T. McGraw. On 7 May 1890, J.T. McGraw conveyed his interest to Charles Battle. 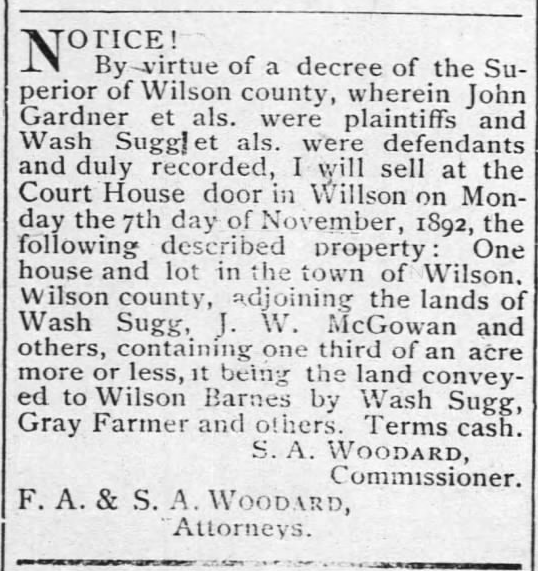 Pursuant to a judgement in a suit against Battle, Suggs and McGowan, the property was sold at public auction on 7 November 1892. Daniel Vick purchased it. Wilson Advance, 13 October 1892. Farmer gave up on her claim, and the Clerk of Superior Court entered a nonsuit. Gray Farmer — Possibly, in the 1870 census of Wilson , Wilson County: Clay Farmer, 60, Gray W. Farmer, 13, and Jonas Gay, 14. Young Gray worked in a brickyard. On 15 March 1876, Gray Farmer, no age listed, married Argent Blount, 20, at Smith Knight‘s in Wilson. In the 1880 census of Wilson, Wilson County: house carpenter Gray Farmer, 27, wife Argent, and children Ellenor, 3, and Charlie Gray, 2. William McGowan — William McGowan appears with five siblings in the 1870 census of Wilson, Wilson County, in the household of their mother, Anna McGowan, 35 washerwoman. Widower William McCowan, age 86, died 1 September 1940 in Wilson of myocarditis. He resided at 513 Church Street, in the middle of block he and his partners had lost to sheriff’s sale 60 years earlier. ← Dr. Clark’s normal school.